June | 2015 | Words. Sentences. Stuff. Looking back to my youth and teenage years, I’m not sure if it ever felt I had competing forces operating in my head. That said, there was the year when I was convinced my life was a movie. Mostly, though, I was an uncomplicated child and whatever forces I possessed mostly determined the infrequency of my visits to the barber and upped my overall body temperature whenever I was within a mile radius of a girl I liked. There were many. I kept my options open, options which remained unrealized. I always suspected girls were a bit more nuanced. 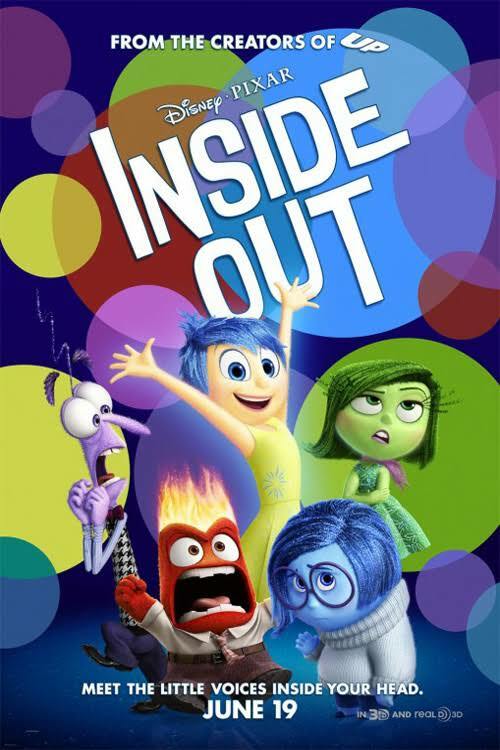 Eleven-year-old Riley has five dominant emotions literally working the controls in her head: Joy (Amy Poehler), Sadness (Phyllis Smith), Fear (Bill Hader), Disgust (Mindy Kaling) and Anger (Lewis Black). Of these, Joy has ruled the roost since Riley was born. Everything about Riley’s life has been viewed through Joy’s positive lens. She lives in Minnesota with loving parents, is an ace at hockey and is surrounded by friends. Thanks to this, she has a sizable collection of little glass balls, colored yellow to represent a happy memory. Other emotions, particularly Sadness, are kept at arm’s length from these memories for fear of turning them blue and unhappy. But then, Riley’s world is ripped two thousand miles apart as she and her family move to San Francisco to follow her dad’s job. The new house is dingy and unfurnished, her room is bare, her friends are two time-zones away and suddenly Joy and Sadness find themselves torn from the control room of Riley’s head and consigned to the high-stacked shelves of long-term memory, determined to negotiate their way through danger and peril to get back to their HQ and make Riley smile again. If you’ve got high-level summaries of Toy Story, Toy Story 2, and Toy Story 3 running through your head, then yes. Pixar loves the “traveling back from the unknown to normality and arriving there changed” plot line almost as much as they love giving inanimate objects emotions. Even giving emotions emotions. But let’s not worry about that. The premise is great, particularly around the glass balls, the most important of which are promoted to core-memories and are fiercely guarded by Joy as they form the basis of Riley’s personality. If this sounds like a visualization of a psychological dissertation, yep, that’s pretty much how it works. And it kinda makes sense and it’s well controlled and managed as the movies progresses. Soon we find ourselves turning slightly against the effervescent Joy and instead root for Sadness, who never seems to be allowed to exist. The personification of Sadness is pitch perfect. From voice to uneasy mannerisms, it resonates far better than any of the others and is a definite highlight. We’re used to looking at Pixar movies on two levels; one for the kids and another for the adults who’ve been dragged along but I couldn’t help wonder if this was a movie aimed primarily at the adult audience. It’s directed by Pete Docter who also directed Up so you know he has honed his emotion tugging skills to Olympic standard, but it goes so far that you could be forgiven for thinking Werner Herzog was at the helm. 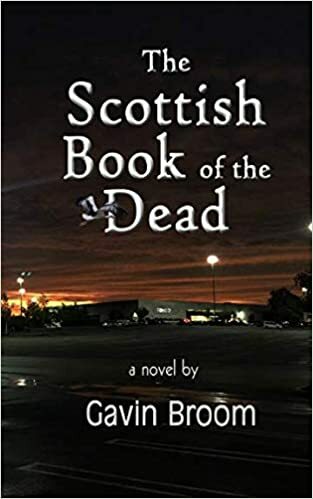 There are some very heavy themes explored here, Riley’s young life goes pretty dark, and the darkness is something that transfers itself into the portrayal of the city. I can’t remember San Francisco ever looking so bleak but it’s an effective method of demonstrating how mood can influence the way we see and approach life. Never fear. While the storyline may be sophisticated and challenging, there are plenty of jokes crammed in there to keep the overall mood light. Jumping into Riley’s dad’s head during a dinner table conversation where his mind had wandered somewhat was great and for members of the audience too young to be squirming at the accurate portrayal of adult male thought patterns, the antics of Anger and Fear, particularly in a dream creation scene, are hilarious. It’s only Disgust who has a hard time stamping her influence on proceedings. It’s a great movie. Charming, powerfully emotional, funny, and beautiful to watch. You can let Grumpy and Cynicism take the night off here; give Contentment room to stretch their legs. Ted was pretty funny, right? I mean, it was funnier than expected, wasn’t it? Funnier than it probably had any right to be? Because at the heart of it, it was an hour and a half extended gag about a living, swearing teddy bear who loved to smoke dope and hire prostitutes and party with the guy who played Flash Gordon. And on these bare bones, Seth MacFarlane, as he is prone to do, threw some random sketch type gags that may or may not have been picked up from the Family Guy cutting room floor. If it has a cutting room. But it was funny, in no small part thanks to the incredible CGI of the bear and the astounding CGI of a live-action Mark Wahlberg. In fact, it became the biggest grossing R-rated comedy ever. Ever. 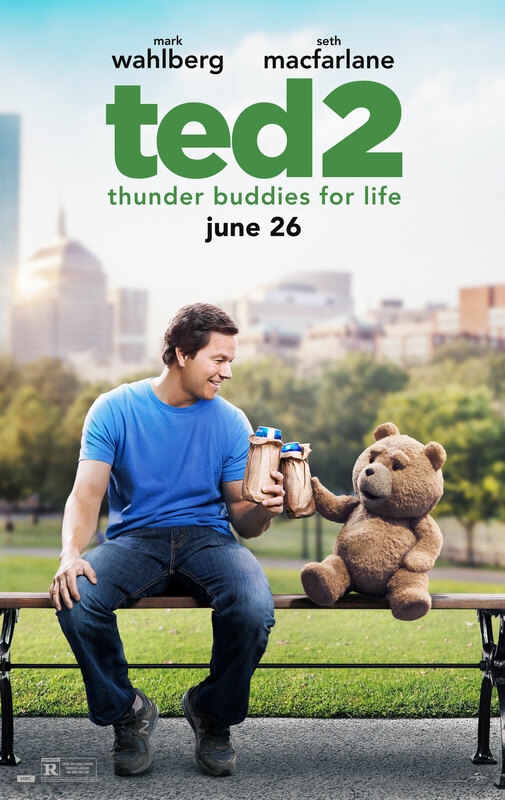 So it’s with some predictability that the sequel, Ted 2, was going to show up sooner or later. The movie opens with Ted marrying Tami-Lynn, a female human and the natural conclusion of a joke that was started three years ago. Poor Johnny (Wahlberg), we soon learn, has divorced from whatever character Mila Kunis played in the original film. Once we get a pointless song and dance number out of the way, we fast forward a year to find the honeymoon is over for the newly-weds who decide to rediscover their love by having a baby. Ted is ill-equipped to perform the necessary because, um, he’s a teddy bear, and Tami-Lynn’s required organs have suffered from years of drug abuse (side-splitting stuff), so the couple are forced to adopt. This request is ultimately declined because, um, he’s a teddy bear, and a chain of events are triggered that result in Ted losing everything because the State of Massachusetts has just realized he’s a bear and not a person. He’s just a toy; a possession. And so begins Ted’s journey to reverse this decision with the help of pro bono lawyer / love interest for Johnny, played by Amanda Seyfried. It’s hard to imagine many people walking into this honestly expecting anything better than the first outing, and that’s an wise position to take. There are no surprises here except that the gag of a living, swearing teddy bear who really, really loves to smoke an awful lot of dope this time is further extended to the two hour mark. That’s not to say there are no laughs to be had. In places, it’s hilarious. Throwing apples at joggers was random enough to make me laugh out loud, the Tom Brady cameo is as good as the trailer promised, and a gross-out mishap in a sperm clinic gilded its own lily with a well-judged hashtag joke. And judging by the number of Gollum gags, it would appear that Seyfried doesn’t take herself too seriously. There’s a lot of barren ground between these high points, however, and for a movie that’s supposed to be about a character trying to prove he is human, the end result is an oddly lifeless affair packed with the same old stuffing.